Unicycle Rose: Do you like laaaaamb? Do you like lamb chops? Do you love the taste of lamb? My opinion? Lamb is good, no, it is great! I say this because every Sunday afternoon when I was young we ate at my grandparent’s house. Imagine a huge long table covered in clear plastic with a lace tablecloth underneath. There sat a huge bowl of spaghetti and meatballs, mushy broccoli, salad, lots of bread and greasy lamb chops. I have eaten loads of lamb over the years without thinking twice about it. I learned early on to cut off the thick pudge of fat and find that tasty meat that existed between the bone and the gristle. Despite sharing approximately 3,000 married days together (at that point) we had never discussed lamb, outside of a petting zoo. At this moment he let me know how much he hates lamb. “It is too gamey,” he retorted. What!!! The needle scratched across the memory record playing in my mind and all I could flashback to was that I Love Lucy episode where Lucy hires an older lady to be her housekeeper. On the first day of the job, Lucy announces she has Little Ricky, her baby. The grumpy housekeeper in a loud voice, shouts, “Baaaaaaby? Nobody ever said anything about a baaaaaby!” And then Lucy has to convince her that the baby is no big deal and she will care for him….well there I was trying to defend my little lamb. Lamb is nothing but fond delicious childhood memories of my Italian grandma’s love with my huge family around the long table every Sunday sucking down pasta and lamb chops. After dinner, while the moms did the dishes and the dads watched TV, my sisters, cousins and I would play office (one desk was my grandma’s kitchen desk area, a second was the walk-in pantry) , listen to records on a huge TV stereo console piece of furniture, or make up skits, using the living room’s fireplace mantle as our stage. Then we would force our parents to watch our skit as we reenacted the Pilgrims’ arrival to America. 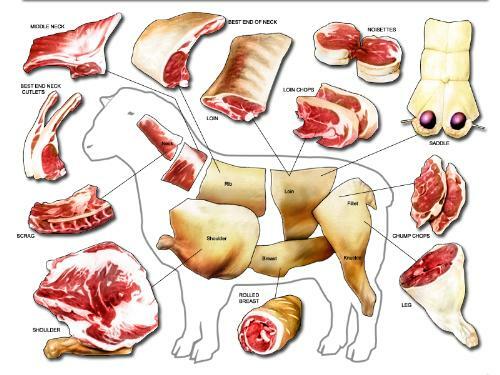 For me, lamb = good memories. Not so for my husband. I realize that lamb is an “acquired taste” for some. But it’s not like it’s sheep testicles, guinea pig, cow stomach or octopus. It breaks my lamb-loving heart to think he ranks it with these food outcasts. Hey, it’s really not baaaaaaaad! I'm with you. Lamb is good. I grew up eating fresh caught quail, dove and pheasant too. sorry rose - i'm with ralph on this one. we never ate lamb growing up, so i have yet to acquire the taste. maybe someday... it's funny how we associate food with the good feelings (sometimes bad) we had in our youth. you were trying to share that with ralph and the boys to create new family memories. rest assured ralph and the boys have their own version of laaaaamb and all it's wonderful associations from you!